Have you ever needed the ability to retain your weapon when climbing, running, sitting in a vehicle, handling a prisoner, fast roping or even breaching? The fact is that there’s always a reason to sling your primary weapon out of the way to not only free up your hands, but to prevent your weapon from moving back around and getting in the way. 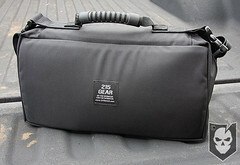 Enter the 215 Gear Multi-Mission Weapon’s Retention. The MMWR provides a low-profile, simply designed retention that virtually disappears on your gear and is ready to use when you need it. If you’re familiar with most common retention systems, they’re worn on the belt, are extremely bulky, and rely on a hook-like system or snap to retain. 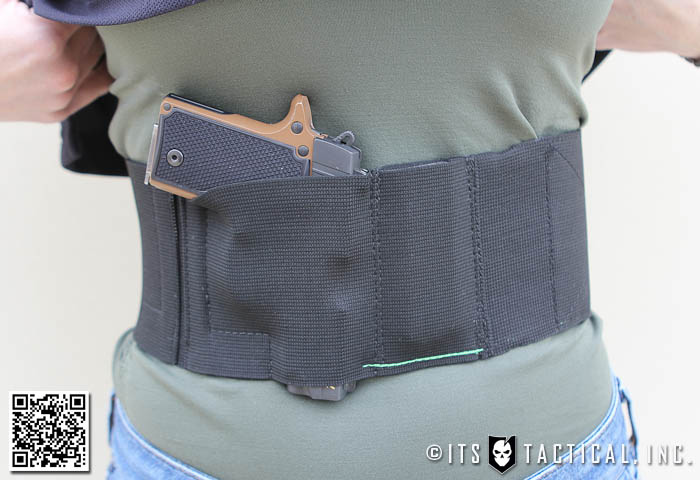 These common systems can get caught on all sorts of things when either left open or closed, and also rely on the use of a belt. The MMWR uses a simple design to secure your weapon with wrap-around shock cord that drops out of the way when left open and maintains a low footprint when secured. Through the use of a small aluminum fitting for the rear attachment, the system attaches to a single channel of PALS Webbing. An update to the MMWR is the use of an ITW Nexus QASM (Quick Attach Surface Mount) Buckle for the front attachment point. Previously the MMWR used a 1″ ITW Nexus Repair Buckle. While good, it required the use of two hands to secure it in most situations. One hand to grasp the female buckle and one to insert the male end. 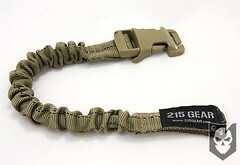 With the use of the QASM all you need to do is grab the strap, slide your hand up to the male buckle and slam it home. As securing your weapon quickly isn’t as important as getting it into the fight, a simple visual check while inserting the buckle is all you need. Like anything, it becomes easier over time to know your equipment and exactly where to reach to secure it without looking. 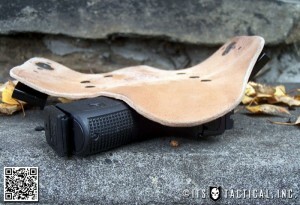 Not depending on a belt mounted solution for weapons retention allows true flexibility under movement or while seated. Since your weapon isn’t attached to your waist with the MMWR, it moves freely under the shock cord. While seated, the weapon simply moves further down and out of the way. This is great when driving, as the business end of your weapon slides down into the space between the door and the seat. Of course this may not be the way you want to roll. You may want your weapon positioned in a way to allow faster access and not under any retention. 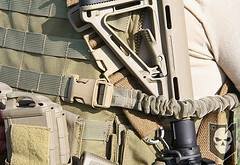 As mentioned previously, the Multi-Mission Weapon’s Retention uses a small aluminum fitting for the rear attachment, which has a small screw-lock design that fits in a single channel of PALS Webbing. 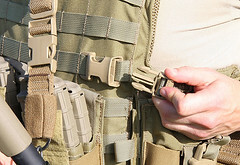 The front attachment is via the ITW QASM, which is a fantastic use of one of the newer ITW buckles. 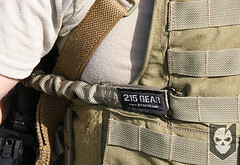 The female portion of the QASM has two split bars that allow it to be slipped onto 1″ PALS Webbing, taking up two columns in a single row (two channels). Constructed with 1″ tubular nylon and shock cord secured with a triple bartack at each end, the overall relaxed length of the MMWR is around 15 1/2″ and fully extended it can reach as far as 24″ in length.